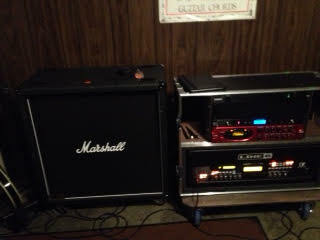 i recently went back to using my Vetta II HD and re-bought a Marshall 1960B. i had been using my PODxt PRO with only the direct out for live applications. well, i upgraded my guitar as well. 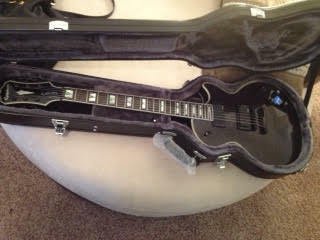 went from a Godin XTSA (with passive pickups) to an Epiphone Phophecy Les Paul Custom Plus EX (with an EMG 81 in the bridge and an 85 in the neck...all from the factory). I loved EMG's when i used them from 2003-2007. never had issues. from the moment i've tried my new setup at rehearsal, i get a weird static/hum swell after stacatto palm mutes. like a delayed compressor kicking in for 1-2 seconds after i stop. it doesn't seem to happen on my guitars with passive pickups. but the sound only comes out of my cab, not through the PA via XLR direct out of the head. Is this an electrical grounding issue? i've tried different outlets in the basement and the issue remains. i use monster cables at rehearsal, but i have a Line 6 Relay G90 that i use live. i cannot figure out where the problem is.....today i'm going to try some foam between the bridge and tailpiece as well as behind the nut on the headstock....i dont know this is where the issue is coming from, but i can't seem to find any forums where other people are experiencing this. Unless you have a ground loop somewhere, it might be some power supply caps starting to dry out. Electrolytic caps can tend to do that. To reduce the possabilty of a ground loop, try powering everything from the same source and see that the returns form a star ground. See that the gear that pulls higher levels of current is powered by a seperate branch of the star. Also make sure that the single ground is really a good ground. I doubt it's your guitar cord and I doubt that a reflash would help this either. It's not a software type of problem. You could try another guitar cord since it's easy and cheap to do. just to see. BTW I don't put much stock in those so called monster cables. It's a lot of money for an imaginary problem mostly. Yes, after many years some electrolytic caps do tend to go bad. They are a very common power supply failure component and one of the first things a tech will check. Some will just replace them out of hand if they are old. It's an easy thing to check for any good tech, just hang a scope probe on each power supply lead and see how much 60Hz there is on it. If s a noisey one is found, start looking for leaky caps. It could be something else but that's a good place to start. Unless you're used to digging around in electronics gear or have the equipment for the job, I don't recommend that you try this yourself. I have no idea what it would cost. It depends on the person, the shop, the area and what not. Maybe you can find a friend who is into this sort of thing that could help you out. You can get the service manual by downloading it from the web if he needs it. But before tearing into the amp, swap out everything else just to be sure it is indeed the amp and not the guitar or something. Ya just never know. If it is the amp it should be constant regardless of the guitar or where it is or where it's plugged in. While it may be worse in some locations due to lighting and what not the hum would still be there if it's the amp. Hey are you running the amp in Stereo or mono, cause the manual to me is confusing. Do you know if the outputs of the Vetta II are parallel? So if running two 4x12 16 ohm cabinets, stereo setup, do I set the swtich to 8 ohms? It's a stereo amp with two channels. Whether or not it's in stereo or summed to mono depends on the patch and how you saved it. No the two internal speakers in the combo are not in parallel as they are each fed with a seperate power amp for stereo if you want it. The two external speaker outputs are in parallel with the two internal speakers. if you want to run all external cabs it's a simple matter to disconnet a wire to the internal speaker or speakers you don't want to use. My first Vetta II had the same problem as you describe above. For that reason I bought another one, wihich now is having the same problem. Line6 was not able to help. Did you find out what the reason is and do you by any chance have a solution? Because this weird sound is getting rather disturbing. I didn't have a problem someone else did, I only suggested a possible cause and solution. I have no idea how it came out or if a solution to the problem was found. Thanks for your response anyway. Like I said it is already my second Vetta with the same problem, and nobody knows the solution. I was glad I came accross this post where somebody had the same problem. Yes,it really was that simple to fix.I use mainly single coil strats and it exaggerated things with me...really bad! Comparable to an old AM radio crackling after playing a note. I cleaned the plug thoroughly and wound my cables in the helix...it fixed it! Line6 was not able to help. So you are saying that Line 6 couldn't (or wouldn't) figure this one out??? Was this over the phone or did they have your Vetta? Nice troubleshooting BTW and thanks for the info!! !